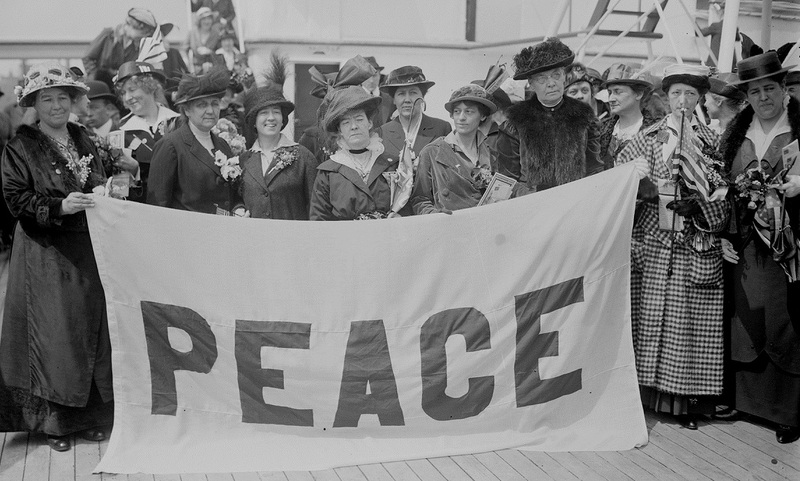 Jane Addams (behind the “P” in “PEACE”) and Emily Greene Balch (behind the final “E”) aboard the Noordam in April 1915, on the way to the International Congress of Women at The Hague. Courtesy of the Library of Congress. When I sailed on the Noordam in April with forty-two other American delegates to the International Congress of Women at The Hague, it looked doubtful to me, as it did to many others, how valuable the meeting could be made. I felt, however, that even a shadow of chance to serve the cause of peace could not to-day be refused. We were first stopped one evening under the menace of a little machine gun trained full upon us by a boat alongside while two German stowaways were taken off and searched and carried away. If the proceeding had been staged for dramatic purposes, it could not have been more effective. One prisoner, with a rope about him to prevent his escaping or falling overboard, shouted Hoch der Kaiser. Deutschland über Alles before he stepped upon the swaying ladder over the ship's side. . . .
After the stowaways were discovered, the travelers still had to face the British blockade of European waters. The authorities held up their ship for four days and the women helplessly watched combat vessels of several nations surround them or steam on pass. Worried they would arrive too late for the conference, the Americans sent messages to diplomats and ambassadors, all of whom claimed to be unable to interfere. The ship was released at last, and they ended up arriving in Rotterdam just hours before the opening session. More than one thousand women gathered for the conference to confer “on the vital subject of international relations.” Addams served as the convention’s president, and Balch was impressed by her skill in managing the meetings and sessions, “difficult as it was to conduct business with so mixed and differing a constituency, with different languages [and] divergent views.” Upon returning to the United States, Addams and Balch collected the proceedings, including the letter Balch had sent to her students, as the book Women at The Hague. To commemorate Balch’s sesquicentennial (she was born January 8, 1867) and to mark the centennial of America’s entry into the First World War in 1917, we present two selections: her 1918 letter to Wellesley College expressing her opposition to the war (which resulted in her termination) and excerpts from her Nobel speech thirty years later. Additional information about Balch will be found in the headnote by Lawrence Rosenwald preceding the selections. Notes: In her letter Balch disparages Junkerism, a reference to the spirit of the Junkers, aristocratic German army officers, especially from East Prussia, who were devoted to militarism and authoritarianism. 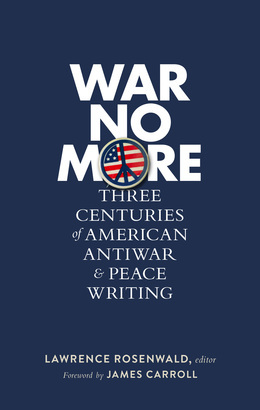 The speech mentions the Kellogg Pact (also known as the Kellogg–Briand Pact or Pact of Paris), a 1928 international agreement signed by Germany, France, and the United States resolving not to resort to armed conflict to resolve “disputes or conflicts of whatever nature or of whatever origin they may be, which may arise among them.” Bertha von Suttner, a Czech-Austrian novelist and peace activist, was the first woman to receive the Nobel Peace Prize, in 1905. Maximilien de Béthune, Duke of Sully was the most trusted minister of King Henry IV of France and was widely credited for bringing about, after the Wars of Religion (1562–98), peace and prosperity during the last decade of the reign.